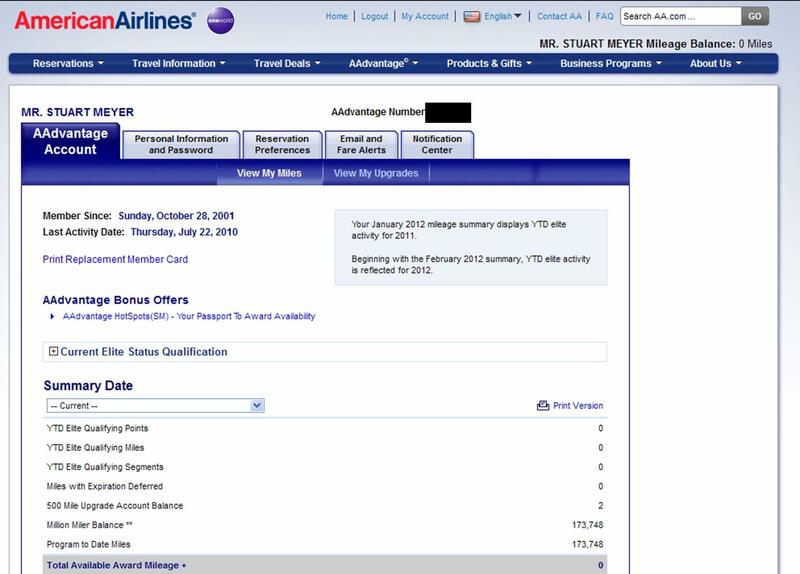 It’s Official, American Airlines has Flushed Away my AAdvantage Miles – What Airline Wants to Win my Loyalty? To close the loop on my previous post, all of my AAdvantage miles have now officially been taken away by American Airlines based upon their imposed expiration. The image below tells the story of my zero (0) mile balance as well as my 10 year history as a card-carrying AAdvantage Member. So, to United Airlines, Southwest Airlines, Delta Airlines, U.S. Airways and other carriers out there… who’s ready to win my loyalty? As most of you know, American Airlines parent company, AMR Corp, is currently in bankruptcy . Without a doubt, I’m sure they would have everyone believe that their embattled airline has been languishing under the oppressive weight of uncontrollable factors, such as the economy and fuel prices. But in my mind and experience, I believe they simply are no longer a very good airline with a track record of a “can’t do” attitude. I’ve drawn this conclusion after 11+ years as an AAdavantage member flying American Airlines regularly for business and pleasure. For the past 2+ years as a business owner. With that kind of history brings a regular inventory of AAdvantage miles, which brings me to a presentation of the evidence as to why I’m taking my final gasp as an AAdvantage Member and American Airlines passenger. 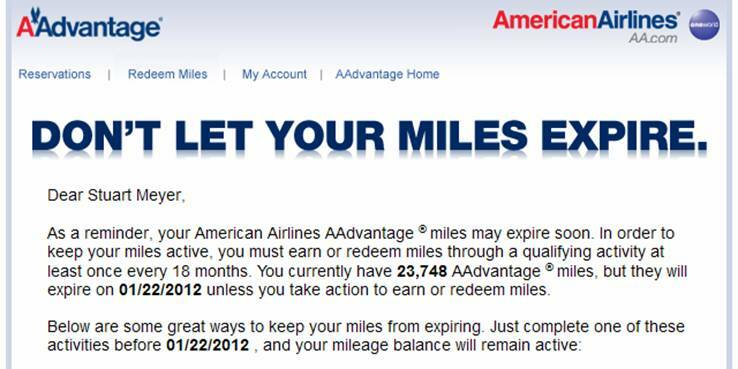 Exhibit A: Within the past couple of months I receive this email letting me know that my current balance of American Airlines AAdvantage miles would be expiring on 1/22/12. Needless to say, I didn’t want to lose what I had earned so I decided to apply these miles toward an upcoming business trip. 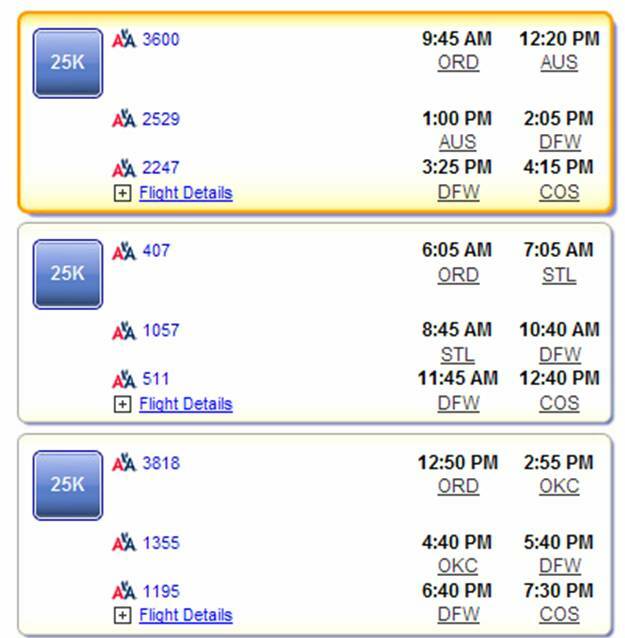 Though my destination was Colorado Springs, American Airlines offers a series of one-stop options on their regular schedule, but the only options they offered to me for the cost of 25,000 miles one-way on the first leg was…. Exhibit B: … only two-stop flights, despite the many one-stop combinations they offer on their regular schedule. Then, because it’s Saturday they want to charge me 25,000 miles one-way for what is usually a round-trip awards ticket (The weekday return was 12,500 miles) Now, it’s January and I have a very important meeting on the following day and the last thing any business traveler in their right mind is going to do is roll the dice on two connections during Wintertime travel. I turned to United Airlines and ended up buying a non-stop round trip ticket for $406 vs. the $508 for the cheapest one-stop ticket American Airlines offered. Further, out of curiosity, I checked United’s MileagePlus options and they offer non-stop flights to Colorado Springs for miles redemption. Exhibit C: … that in order to share these earned miles, it would cost me $191.25 per 15,000 miles to transfer these miles that I had already earned to my wife. Because I have almost double these miles, the total would have reached nearly $400… the price of my current ticket. So then, I explored what other options this seasoned and previously loyal AAdvantage Member had to keep these miles from evaporating. Then I discovered on the American Airlines website that I could reactivate these miles. I clicked on the button to begin the process and discovered… Exhibit D: …that the price for reactivating miles would cost me between $200 – $600, reinforcing the best viable financial decision would be to simply let these miles go off to whatever place in the hemisphere that expired miles go to prevent a big airline from whatever devastating financial repercussion is caused by unused award miles. Exhibit E: … the always controversial baggage charges, which actually took me quite a bit of exploration to find on the Baggage area of the American Airlines website. $25 for the first checked bag and $35 for the second checked bag, but did you know those additional bags will cost you $150 per bag? This exhibit proves that those Southwest Airlines commercials are not only funny… they are true. The final exhibit in this case of the final gasp is perhaps the biggest reason I believe American Airlines is in bankruptcy. Exhibit F: A quote from Chairman, CEO and President of AMR and American Airlines, Thomas W. Horton (come to think of it, does it make business sense to place the burden of 3 titles overseeing two companies on the shoulders of one person). Horton suggests that “customers are always our top priority…” and that we will continue to get the “high-quality service they (we) know and expect from us.” Well Mr. Horton, here’s the root of the problem… you seem to think that customers are your top priority and that your service is of the highest quality, but simply put in my experience of 11+ years as an American Airlines AAdvantage Member, flying both domestic and international… it simply is not. To succeed, you must build a business around every touch point of the customer experience and find a way to exceed expectations by putting their needs first at every turn. Customer impact is the first consideration, not the last consideration. You must make sure your “house” is in order from an operations standpoint to help you resist the temptation to make your customers shoulder the financial burden of waste and inefficiency. You must balance Wall Street’s obsession with measuring success in increments of 3 month quarters, which often creates the temptation for risky short-sighted maneuvering/decisions, with the genuine drive to do what it takes to build a truly loyal and evangelizing customer base for the long-term. You must create/maintain a business culture which is inspired to “walk the talk” every second of every minute of every day of every week of every month year in and year out. An airline is a service business as much as it is a transportation business. You must learn that it’s more cost-effective to maintain a business operation focused on taking care of the customer the first time around than to have costly programs which handsomely compensates bad customer experiences. Finally, if you truly want to measure the health of any business culture, look to the front lines of customer service at all touch points and observe closely. While you can pay people to work, there is no amount of money you can pay them to “care” if your business culture fails to inspire, empower and energize. Ask yourself, is there “life” in these people’s eyes and “fire” in their hearts for what they do and the brand they represent? If a business cannot do these things due to their corporate hands being tied by all levels of structural and financial barriers as well as organizational dysfunction, then perhaps an iconic business that was once so relevant has arrived at a time in its business history where it is no longer relevant in the marketplace. However, I believe that those businesses with a genuine passion, drive, motivation and belief for the value they are creating for society can find a way to make it happen. The question is, how far removed from those days is the corporate organization that is presently situated behind the American Airlines branding and what is it going take to get back to the days where it was clear that American Airlines took genuine pride in what they do. Time will tell. As for American Airlines, when you read this post please resist the temptation to “make it right” by removing the expiration from my miles or offering me travel vouchers. Instead, share a copy of this post with Mr. Horton, his executive team and the Board of Directors for both American Airlines and AMR Corp in hopes that it might be a small part of the turning point for what was once a great airline.